The most macho thing I expect to see in the movies all year happened in “Klumpfisken” (“The Sunfish”), a slice-of-life Danish film from first-time writer-director Søren Ball. Kesse (Henrik Birch), a third-generation fisherman from Hirthals, a provincial town in northern Jutland, is moving around on his boat at night too quickly, and falls and cuts his hand. Badly. Later he gets 20-25 stitches in it but now he doesn’t have the time. So what does he do? He duct-tapes it. Kesse, by the way, is moving around on his boat at night too quickly because he’s been illegally fishing over his quotas and selling the rest on the black market. Not because he’s shady but because he’s upstanding. He’s a decent man being squeezed by forces beyond his control: international economics, government regulations, and big fisheries. The movie opens on a typical day. Here’s Kesse on his boat on the ocean. Here he is telling first-mate Lars (Lars Torpp Thomsen) to watch the lines. Here’s the catch, the transfer, the inspection, the clean-up. He gets a meal, the same meal, goes home, watches TV, goes to bed, starts over. He’s a hard man to know. He also owes 100,000-150,000 krone. Because he’s a gambler? An alcoholic? Nope. It’s just what we’ve seen. He doesn’t make enough money to support the making of it. Kesse’s real problem, besides being squeezed by all of the above, is Lars. He can’t afford to have him on but he can’t let him go, either. Lars’ father had been Kesse’s first mate, and he’d died in the nets, right in front of Lars when the kid was 13. There’s a sense that more than 150,000 krone is owed. Kesse, in fact, doesn’t just not fire Lars; he takes on another hand, Gerd (Susanne Storm), a biologist from a university in Copenhagen doing a study on fishing populations. Initially he views her as the enemy: Someone who cares more about fishing populations than fishermen. But he warms to her, and she to him, and eventually a romance develops. He’s got charm but he’s truly provincial—rarely having traveled 15 km from Hirthals. They go for walks (where he misses all her signals), go to an aquarium, and scuba dive there. They watch the Ocean Sunfish, a huge, ghastly-looking creature, swim slowly by. But the money he gets by having her temporarily on board won’t save him, so he succumbs to the inevitable: He lets Lars go. The precariousness of their situation apparently comes as news to Lars, who curses him, gets drunk, curses him some more. Lars is truly a waste of space; he’s there to make Kesse look good. Then Kesse makes a bad choice. Does he agree to take Lars back because he’s fishing over the quotas or is he fishing over the quotas in order to take Lars back? I assume the latter. He’s going to save his friend, or “friend,” and his business, by embracing illegality. The downfall of every good man. This works well once, twice. The third time, his contact doesn’t show, and he’s forced to move the extra fish to his home, where Gerd awaits. “I thought you were better than this,” she says, leaving. So did he, he realizes, and lets Lars go again. With the illegal fish still in his garage? Bad move. That night, instead of his contact, it’s the inspectors who arrive, tipped off by Lars. Kesse is fined and temporarily loses his license. But he can’t afford temporarily so he loses it all. These are the circumstances that finally propel him out of Hirthals and onto the train to Copenhagen. To be with Gerd? Will she take him? Who knows? The point for writer-director Søren Ball is to get him out of town. Fin. No pun intended. The Ocean Sunfish is apparently the biggest, heaviest bony fish in the world, but ... Is it also supposed to be Kesse? Something that shouldn’t exist anymore? Something almost prehistoric? Early on, Kesse’s friend calls him a dinosaur. So maybe that’s it. Even so, as a metaphor, it hardly resonates. 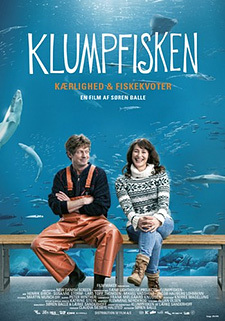 “Klumpfisken” is a quiet, matter-of-fact film that’s altogether too quiet and matter-of-fact. It’s interesting only in a “National Geographic” kind of way. For me, there’s just not enough story there. The better story—what does a man who has lost everything, including the only home he’s ever known, do?—begins exactly at the moment we leave.